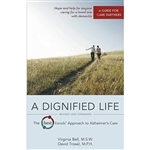 Books can be an extremely useful aid for people with Alzheimer's or dementia. Picture books help people reminisce, as images are a very powerful way to access memories. They can help increase communication, whether it's with relatives, caregivers, & friends. If used in a group or care setting, they can bring individuals with dementia together and can be used as an entertaining activity that helps combat boredom, or even depression. 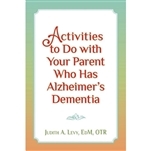 Some books provide background information for caregivers which this can help bridge the gap between different generations. Formal education in any stage of life will help reduce your risk of cognitive decline and dementia. Awareness of dementia is slowly becoming more widespread, and the introduction and promotion of information has helped to assist care providers with patients. 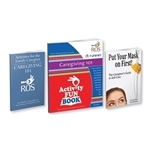 We have a myriad of resources through our assortment of books to provide insight to Alzheimer's disease and dementia as well as to encourage visual stimulating activities to the person afflicted with the disease. An entertaining activity book! ..you will be amazed at the "magical" quality! Fun themes to paint with water designed to nurture creativity and imagination! The perfect activity book for Christmas Day! Great feature that includes the finished product on the page! 101 Stories of Caregiving, Coping & Compassion! "The Complete Guide to Alzheimer's Proofing Your Home"
Large Print Book - Verses from the Bible..
Great pick for our bilingual purchasers!! Chuckle full of activities for people with dementia for a holiday fun celebration! Wonderful to help with memory skills! Filled with fun facts for every season! Learn new communication and engagement strategies to improve time spent with your loved one. A must reading’ for care partners, both professional and family! 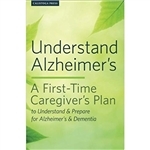 A helpful guide to coping and preparing for individuals with Alzheimer's and dementia. A heart warming journey between a husband and wife!